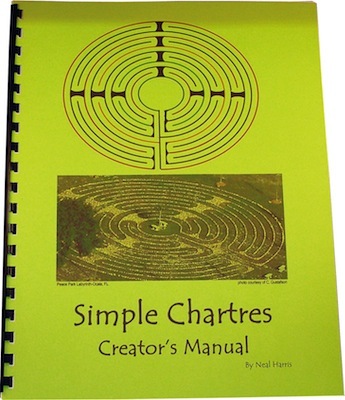 19 page, step-by-step instruction manual with color diagrams, for designing various sizes of outdoor, Simple Chartres labyrinth designs (also known as the Dromenon pattern). This pattern lacks the religious symbolism found in the full Chartres Cathedral design (such as the rosette in the center and the lunations) so is a popular choice for creator’s looking for a secular choice that still has the look and feel of the Chartres design. Sharing the identical walking path, the Simple Chartres design predates the Chartres pattern and may have been developed by the Druids who used it in various healing and spiritual growth ceremonies. With its freedom from both the design complexities and religious symbolism of the Chartres pattern, the Simple Chartres design is a popular choice among labyrinth enthusiasts when creating a walking labyrinth design intended for a secular audience. Many create prayer gardens near the design to add greater peace and significance for those coming off the Simple Chartres labyrinth, giving them a true respite from the everyday.